Quick, easy, perfect breakfast sandwiches that you can either eat fresh or freeze for future use! additional toppings like sliced bell pepper, onions, avocado, tomato, etc. Preheat oven to 350. Lightly grease/butter/spray a whoopie pie pan. Set aside. Crack the eggs into the jar of a blender and add water, Tabasco sauce, and kosher salt. Pulse until the eggs are blended but not overly frothy. Pour the egg mixture evenly among all the cavities of the whoopie pie pan (if you use 9 eggs, there may be a little leftover–8 eggs is a tiny bit too little and 9 is too much. Alas.) Bake for 8-11 minutes or until the eggs are puffed and solid in the middle but not brown at all. Remove from oven and turn the oven to high broil. Place the English muffins, cut side up, on a baking sheet and, if desired, butter lightly. Toast under the broiler for 2-3 minutes, keeping a very close eye on things (broiler burning is a disaster we can all relate to). Remove from oven. Place the meat on the English muffin bottoms. Top with egg, then cheese, then the toasted top half of the English muffin. Eat immediately. Option 1: Place the cooked egg patties on a plate or baking sheet and freeze completely. Transfer to a zip top bag. 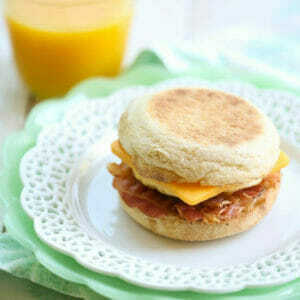 To reheat, cook in microwave for 30 seconds or until warm, then assemble breakfast sandwiches according to directions. Option 2: Don’t toast the English muffin. Allow the egg to cool completely. Assemble according to directions, then wrap in parchment paper and store in a freezer safe container or ziploc bag. When ready to eat, wrap in a clean paper towel and cook on 30%/defrost in microwave for 90 seconds. Cook on full power for 45-60 seconds (depending on microwave power). Allow to stand for 1 minute before serving.